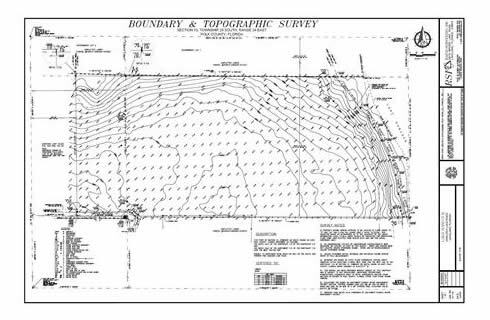 A topographic survey or a "topo" survey is a survey of the natural and man-made features on a parcel of land. The surveyor uses conventional and/or GPS equipment to make ground measurements that determine horizontal locations and vertical elevations on grade breaks, existing structures and above ground features. The survey is generally used for graphically depicting the surface of a particular parcel of land and any man-made features and elevation changes. The engineer or designer will then design a site plan allowing for drainage, dirt excavation, and other new construction features to best fit the parcel of land. The local governing agencies will also want to review the topographic survey before permitting. Rapid Surveying can provide an accurate survey based on the site, client, engineer, and local agency requirements. We need to have a detailed list at the beginning of the project to help us complete your survey A.S.A.P. Establishing Elevation Datum on the Site. Rapid Surveying Inc. © 2019. All Rights Reserved.